“The best word for it is disastrous,” said Pelto, who recently wrapped up his annual survey in the North Cascades. 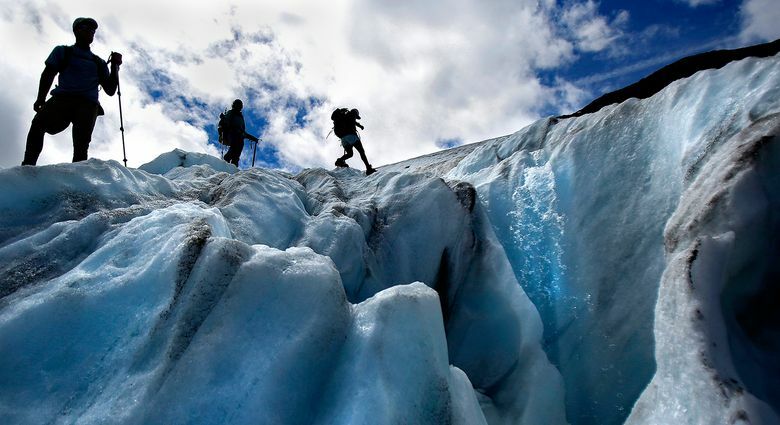 On mountain after mountain, he and his team encountered bare ice and gushing meltwater on glaciers that would normally be blanketed with snow. On average, Pelto estimates glaciers across the rugged mountain range will lose 5 to 10 percent of their volume before the summer is over. “This is the single biggest volume loss in the last 50 years,” said Pelto, a Nichols College glaciologist. One year is just a blip in the life of glaciers. But 2015’s dramatic melt comes on top of an ongoing retreat that has seen glaciers across the Northwest shrink by 25 to 40 percent since the mid-1980s, reflecting trends around the world. 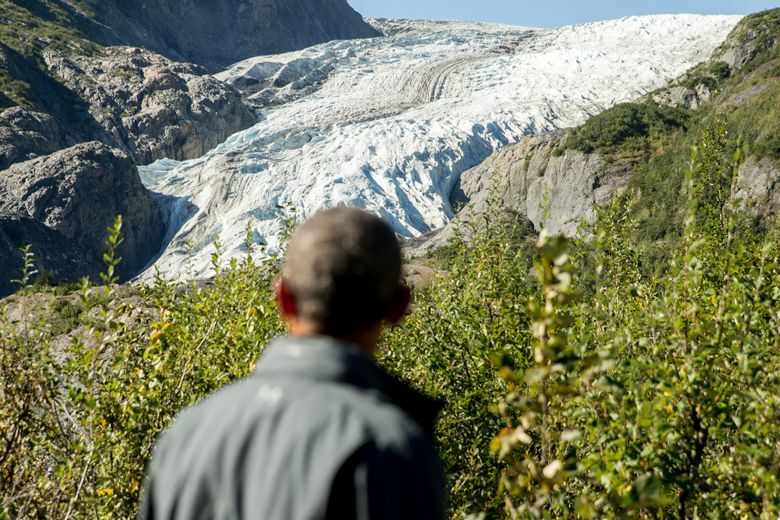 With President Obama’s visit to Alaska, where he ventured onto a glacier last week, the fate of the world’s icy regions is getting special attention. In the Northwest, where glacial-fed streams and rivers provide drinking water, hydropower and a cooling flow for salmon, the economic importance of glaciers is undisputed. The cumulative loss of ice is already impacting flow in some Washington rivers. But regional planners are just beginning to use results from surveys like Pelto’s to help forecast what a future with fewer and smaller glaciers will hold. “We’ve largely ignored the glaciers in terms of their importance to water balance in this state,” said Jon Riedel, a glacial geologist for the National Park Service. It’s not clear what role — if any — global warming played in this year’s unusual drought. Precipitation across the Northwest was about normal, but temperatures were so warm that little moisture fell as snow except at the highest elevations. Add in a hot, dry spring, and glaciers are taking a major hit, Pelto said. 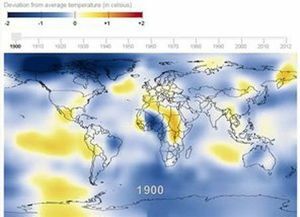 While 2015 may prove to be a fluke, computer models predict similar conditions will become more common as atmospheric levels of man-made greenhouse gases increase. Even without the added kick from global warming, some droughts in the past have lasted a decade or more. “The scary thing to think about is what happens if the next 18 out of 20 years are like this,” Riedel said. 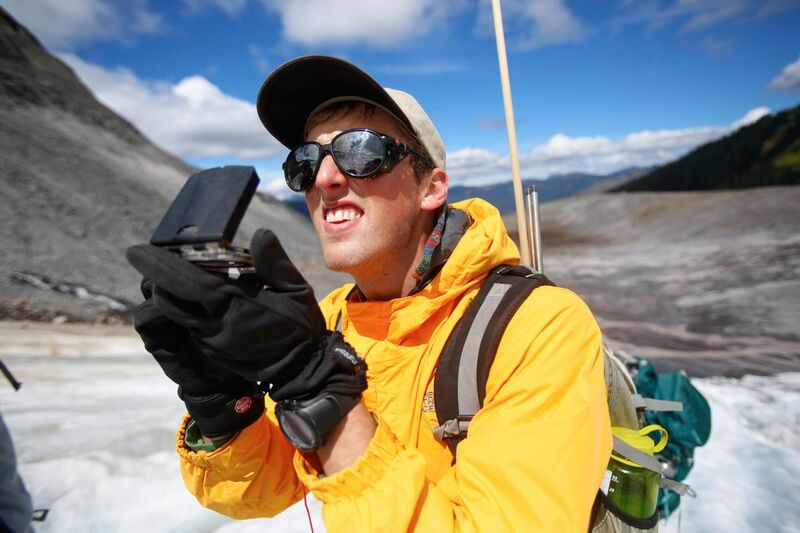 Pelto and his crew normally use long poles to probe and measure snow layers 15 to 30 feet thick atop the glaciers. This year, they rarely bothered to bring the poles with them. 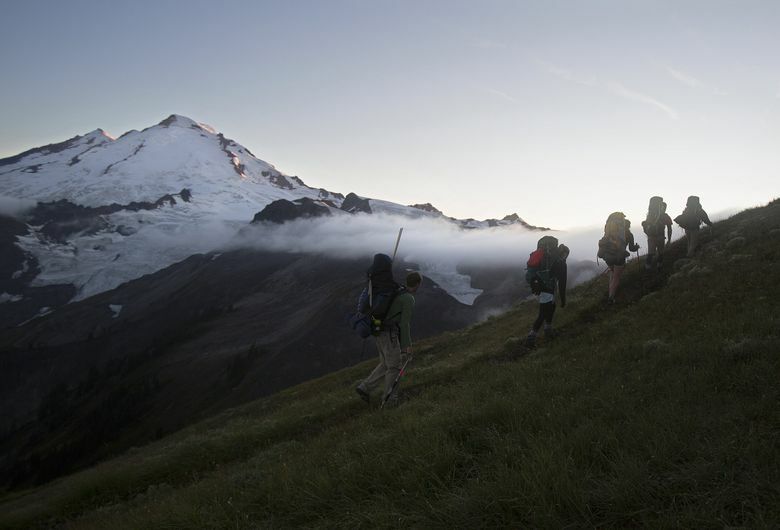 “The snow is just not there,” he said in August, pausing midway up the Sholes Glacier on Mount Baker’s northeast flank. Blue ice glinted at the surface, a sight that’s rarely seen, Pelto explained. 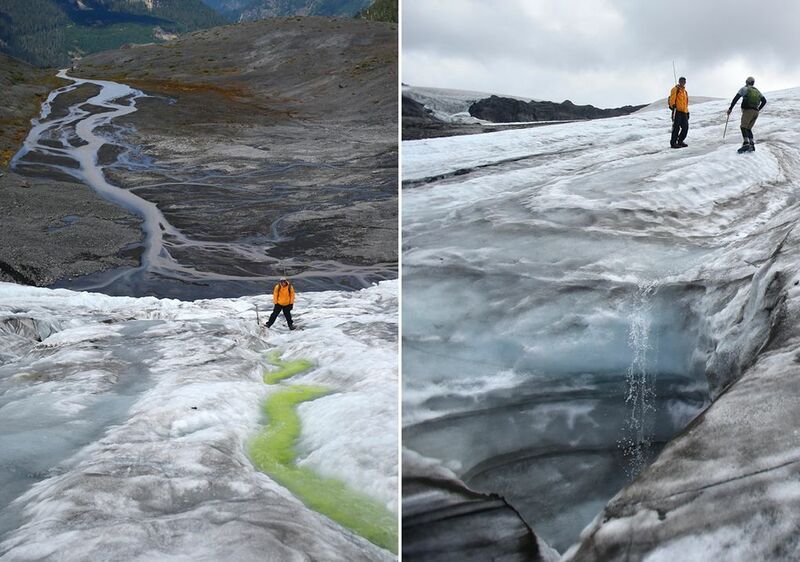 Meltwater poured off the glacier in sheets and carved deep channels through the ice. With no insulating snow layer, ice melts rapidly. 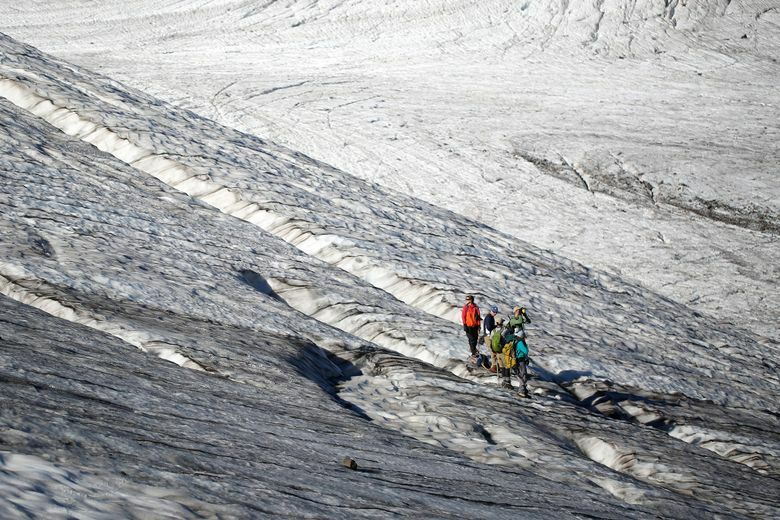 Measurements in August by the Nooksack tribe showed the glacier, which feeds the Nooksack River, was losing a foot-thick layer from its surface every week. For glaciers, snow is like income — a steady accumulation that allows them to survive and provides a buffer in lean times, Pelto said. The balance sheet is simple: When melt exceeds accumulation, glaciers shrink. Except for a handful of years, the North Cascades’ glaciers have been on a downward trajectory since Pelto started tracking them in 1983. He launched the project at a time when scientists were starting to consider global warming’s impacts. A national science panel pointed out the need for long-term observations across a glaciated mountain range. “I thought: I can do that,” Pelto recalled. Though Pelto is based in Massachusetts, he picked the North Cascades, which stretch from Snoqualmie Pass to the Canadian border and contain nearly 700 glaciers — more than any area of the U.S. outside of Alaska. Over the decades, Pelto has documented the death of several. Federal research agencies rarely fund long-term monitoring, so Pelto cobbles together a shoestring budget every year from private grants and his own bank account. He recruits students and his adult children as field assistants. Collectively, they’ve taken measurements on more than 100 glaciers and assembled one of the most comprehensive data sets in North America. The Sholes is one of a dozen or so glaciers Pelto visits every year. 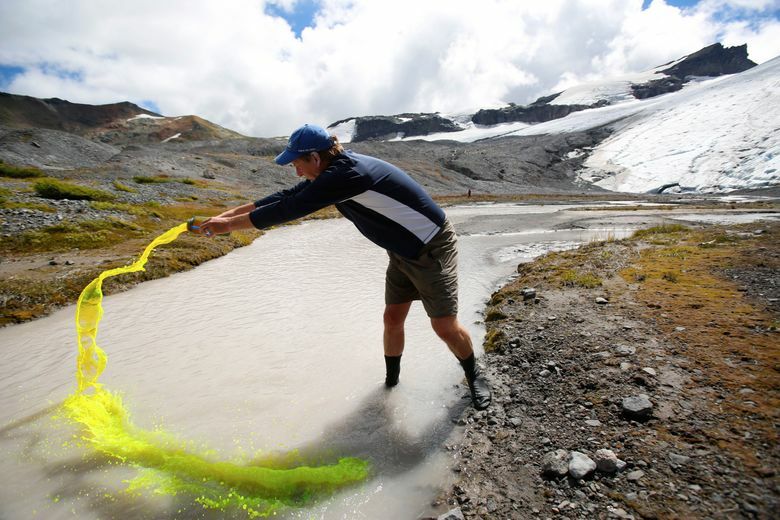 Last month, his five-person team dumped chartreuse dye into streams pouring off the ice to gauge the velocity and volume of the flow. They mapped the surface and peered into crevasses to measure past snowfall layers. Glaciers play an important role in Northwest water supplies, acting as vast storage reservoirs. 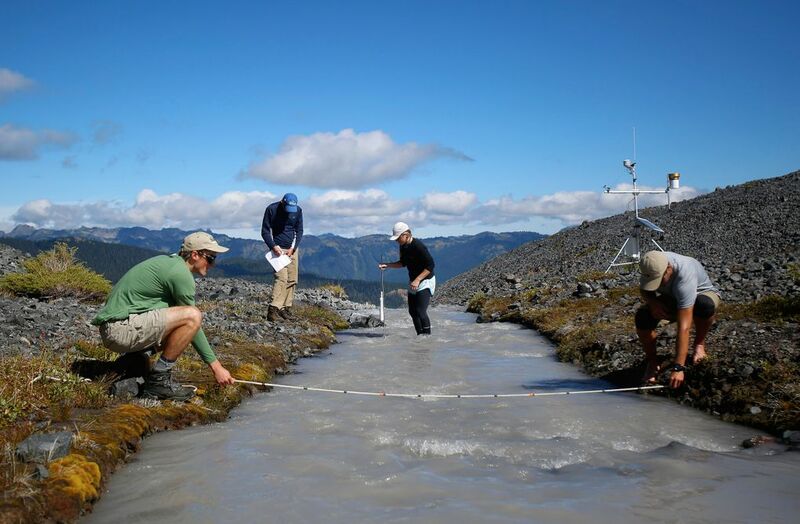 During late summer, when most of the snow has melted and rain is scarce, glacial meltwater can account for up to 25 percent of the flow in some rivers, said Riedel, who monitors glaciers in Washington’s national parks. As glaciers shrink, so does that contribution. “We’re losing that buffering capacity, that glacial reservoir, as our glaciers melt away,” Riedel said. On the Skagit River, glacial meltwater volumes have dropped by more than a fifth over the last 30 years. The loss in glacier volume in the watershed is the equivalent of 80 years’ worth of domestic water supply for Skagit County, he said. Scientists haven’t yet ventured guesses on how long Washington’s glaciers are likely to survive in a warming world. Glaciers have advanced and receded repeatedly on geologic time scales, driven largely by tiny shifts in the Earth’s orientation and sunlight reaching the planet. 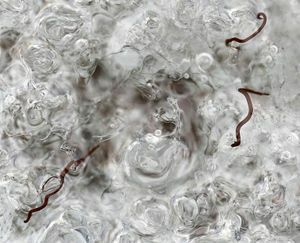 Those factors can’t account for the current, rapid retreat around the globe — but scientists still don’t know how much blame to assign to human activity. Based on analysis of ancient forests that are emerging as the ice pulls back, Riedel estimates the region’s glaciers are smaller than they have been in at least 4,000 years. Tall peaks like Mount Baker and Mount Rainier aren’t about to lose their icy caps anytime soon. Even this year, snowfall at very high elevations was near normal. It’s the lower elevation glaciers and mountain ranges — like the Olympics — that will see the biggest changes, said Bill Baccus, a scientist at Olympic National Park. “Our glaciers are already struggling, and their rate of decline is higher than in other parts of the Pacific Northwest,” he said. By the time his 2-year-old son is grown, Fudge expects many of Washington’s glaciers will look like those in Glacier National Park — small patches of ice clinging to shaded slopes. “I think it’s going to be on a generational time frame,” he said. For the 53-year-old Pelto, a generation has passed since he first strapped on crampons and traversed the North Cascades. Each year remains fresh in his mind — but some of the sights from this summer were the most painful he can recall.